Apple CEO Tim Cook took the stage today in Cupertino, Calif. with Apple fans anxiously anticipating the start of ‘Spring Forward’ and details on the Apple Watch, a new MacBook and possibly an update to iOS. Instead, attendees were ooh-ed and aahh-ed by the stunning visuals of Apple’s new flagship store in China. Apple currently has 21 stores in the Asian nation and has announced plans to reach 40 by year’s end. Cook, not to disappoint, introduced HBO CEO Richard Plepler, and wowed all with the announcement that HBO Now will be a service joining Apple TV. The standalone service will be $14.99 per month—first month free if you sign up in April—and if you subscribe by then, you will also have it in time to see the Game of Thrones season premiere. Plepler teased the audience with a never-before released trailer for the upcoming season before Cook retook the stage. Cook noted, "Apple TV has become the category leader…25 million units sold so far,” and it is fair to say that number will improve as announced today the cost of Apple TV will drop to $69—most definitely a response to the many streaming options on the market today. Next on the agenda: the iPhone. With over 700 million sold and a 99 percent customer satisfaction rate, year over year, the iPhone is seeing 49 percent growth versus the rest of the industry at 29 percent. As Cook put it, "The iPhone is growing stronger than ever." Building on the launch of Apple Pay, Cook notes that in the United States today, over 700,000 places accept the service—with plans for 100,000 Coke machines to accept the technology by the end of 2015. Senior Vice President of Operations Jeff Williams was also announced to the stage to talk HealthKit, and more specifically ResearchKit. The idea is to leverage the HealthKit to use the iPhone to improve medical research. Users have the option to participate in ResearchKit, which defined by Williams is, "a software framework made specifically for medical researchers,” that has the ability to transform the iPhone and HealthKit into "powerful diagnostic tools." Currently there are apps addressing several of the most common medical issues in the U.S.: Parkinson’s disease, Breast Cancer, Cardiovascular disease, Asthma. Williams stated, "There is nothing more sensitive than your medical data," followed by the affirmation that Apple will never see your data. 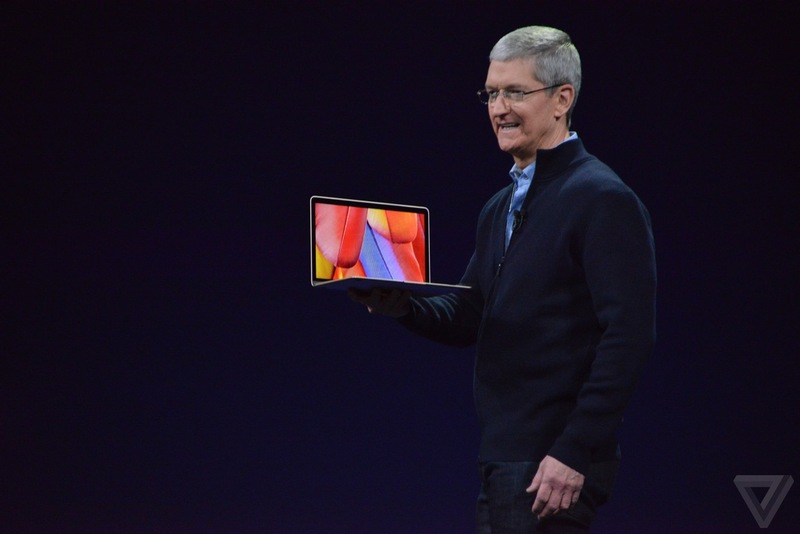 Always the crowd pleaser, Cook introduced the new MacBook. "The definition of portability has changed in the last several years, led by iPhone and iPad. We challenged ourselves by taking everything we'd learned and do something incredibly ambitious and bold. We challenged ourselves to reinvent the notebook, and we did it." Phil Schiller, Apple’s senior vice president of worldwide marketing took the stage to discuss the specs of the new MacBook. It is the lightest MacBook at only two pounds and 24 percent thinner than the MacAir. It has been given a new keyboard mechanism as well as backlighting system that gives each key an individual LED. Schiller notes that it is also, "four times more stable than that scissor mechanism, but 40 percent thinner. We also made the keycap larger." The display is 12 inches and sports the thinnest display in Mac history at only .88mm thick. Apple has also reinvented the track pad with its innovation of ‘Force Click.’ Four sensors track pressure and the classic ‘click’ will be managed by software. The new pad offers a new right click experience, and based on the pressure used and the application employed a slew of capabilities can be completed—For example, in video playback pressure controls playback speed. The new machine will tout up to a 2.9GHz processor, with what Schiller calls, “The densest logic board ever in a Mac." One will also notice the new release does not have a fan, and the space where one would expect said fan is now battery—claiming enough power to support 9 hours of wireless Web browsing and 10 hrs of iTunes movie playback. The batteries have been specially contoured to fit the available space, so they have different look that the traditional battery. The newly announced innovation is categorized as, "The vision of the future of the notebook: one of extreme portability." The MacBook comes with HDMI, power, USB and DisplayPort—all in one connector. The USB-C cable is reversible, versatile and the third size of a standard USB. The MacBook will be available on April 10, ranging in price (based on processor) from $1,299 to $1,599. 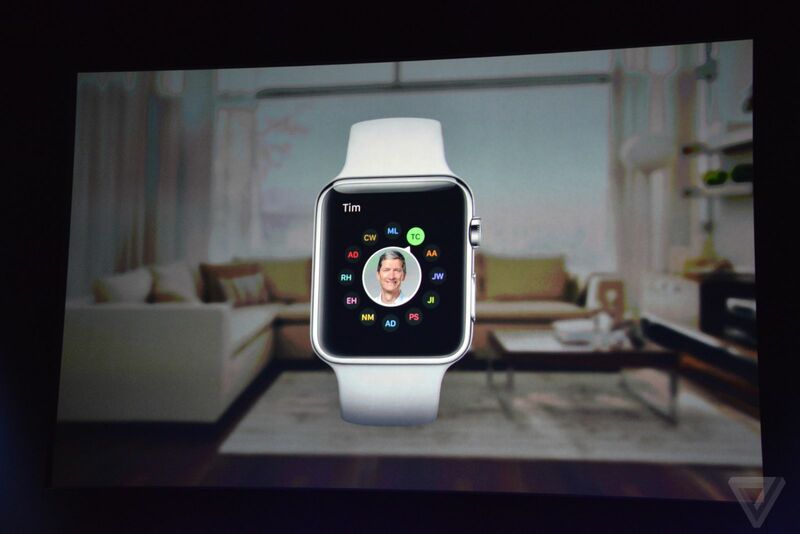 On to the Apple Watch as Cook retakes the stage. Cook recounts the different faces and various details he lamented upon in the initial release (read TMC’s analysis here), and discussed communication features like Digital Touch, which he notes, "You draw on your watch, and that touch will be animated on your friend's watch exactly as you drew it." After introducing Christy Turlington Burns, and showing a nice video of her running with giraffes as Apple Watch helps Burns beat her marathon record and track her progress—she will be blogging her progress. All in all, the Apple Watch portion of the program has been fairly anti-climatic, with no real “wow” moment. So, the Apple Watch can make phone calls, open your hotel room and check your flight info.—should we really be impressed? Is the 18-hour battery life is something noteworthy? The competition—i.e. 360 and G Watch users—are getting up to two days of battery life. Apple will be releasing limited quantities at select retail locations of the “Apple Watch Edition” with pricing that begins at $10,000—that’s right you read that number correctly! The watch, any edition; from the Sports that starts at $349 and up to the Apple Watch Edition starting at $10,000, will be available for pre-order April 10, and available for purchase April 24. In the grand specter of Apple announcements, this one didn’t shock and awe like some in years past. Whether it’s fair to put that on Cook’s shoulders is unclear, but from an outsider looking in (and not an Apple person—full disclosure) it would seem that WHATEVER Apple throws against the wall sticks, primarily due to its loyal customer base.